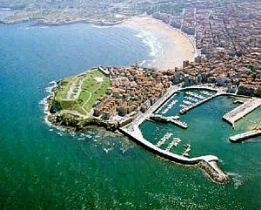 Car rental Gijon is the best way to explore this city of numerous museums and splendor clean beaches. We compare car rental prices in 30,000 world car hire locations so you don’t have to do it yourself now! Experience the city with our car rental Gijon and its locations at Gijon Railway and Gijon city car rental office. Use our form to add your location and get the best deal for cheap and reliable rental car! Our links with top car rental suppliers guarantee the most affordable price for your dream car! With our car rental you will move freely from one city part to another, from San Lorenzo beach to Barjola Modern Art Museum, and then to many local restaurants offering delicious traditional cuisine. Beautiful coastline curve allows you to admire the unique landscape created by rocky cliffs and huge boulders with sheltered bays between them. RentalCars24h.com offers you reliable car rental Gijón services that will help you to feel free and independent when moving around the town. Providing best online prices for car hire Gijón services, RentalCars24h.com allows you to save money each time when you rent a car in Gijón.